This is by far the freakiest Pride club ever. Just take a look at the lineup! The quartet ”JeSuisLeFuq” – podcast geniuses Amie and Fanna (Raseriet) – queen regent of Instagram; Cassandra Klatzkow – world renowned DJ Evyn Redar and the one and only relationship expert Emilie Ebbis Roslund. 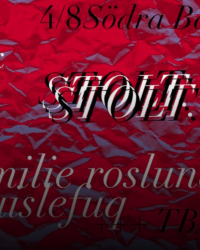 Club STOLT (“brave”) will be a night of sweaty reggeaton, hip hop and 200% feels. Expect joyfull rythms mixed with sing-a-long-medleys.